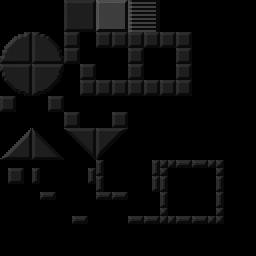 I have been working on a simple collision tileset to help me plan out some rooms and stuff easier so I can just sketch over them later on. This was inspired by a talk by Cardboard Sword where they described their process for creating the tilemaps inside Paper2d in UE4, where they had a layer in the tilemap dedicated to the collisions. I will be adding more, this is just a first pass, I'm also sharing this with Leon so he can test it out for his little game. I should get some nice feedback that should allow me to fill in any gaps.